What is the Big Bang Theory? How was our solar system created? 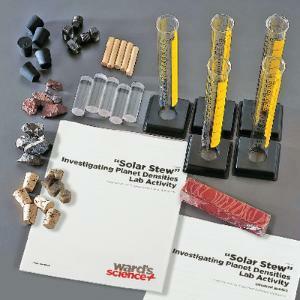 Some theories revolve around the Big Bang Theory and in this lab activity students will use standard laboratory equipment to obtain mass and volume data for objects representing material from the planets in our solar system. Using this data, they calculate the densities of the materials, compare to the estimated planetary densities, and determine which substances come closest to matching the planetary values. Students utilize both framework principles of Matter and Its Interactions (PS1) and Earth’s Place in the Universe (ESS1) when completing this activity.